A throttling of the flow causes significant reduction in pressure, becauses a throttling device causes a local pressure loss. A throttling can be achieved simply by introducing a restriction into a line through which a gas or liquid flows. This restriction is commonly done by means of a partially open valve or a porous plug. Such pressure losses are generally termed minor losses, although they often account for a major portion of the head loss. The minor losses are roughly proportional to the square of the flow rate and therefore they can be easy integrated into the Darcy-Weisbach equation through resistance coefficient K.
For example, consider a throttling of an ideal gas flowing through a valve that is partially open. From experience we can observe that: pin > pout, vin < vout, where p is the pressure and v is the specific volume. We can also observe that specific enthalpies remains the same, i.e. hin = hout. The specific enthalpy is equal to the specific internal energy of the system plus the product of pressure and specific volume. Therefore, if pressure decreases then specific volume must increase if enthalpy is to remain constant (assuming u is constant). Because mass flow is constant, the change in specific volume is observed as an increase in gas velocity, and this is also verified by observations. If there is a change in the internal energy, u, then there must be a temperature change. Normally the temperature of the fluid will drop. However in special cases, the temperature may remain the same or it may increase. A partially open valve or a porous plug can be used to reduce the pressure in a system. An application of the throttling process occurs in vapor-compression refrigerators, where a throttling valve is used to reduce the pressure and reduce the temperature of the refrigerant from the pressure at the exit of the condenser to the lower pressure existing in the evaporator. 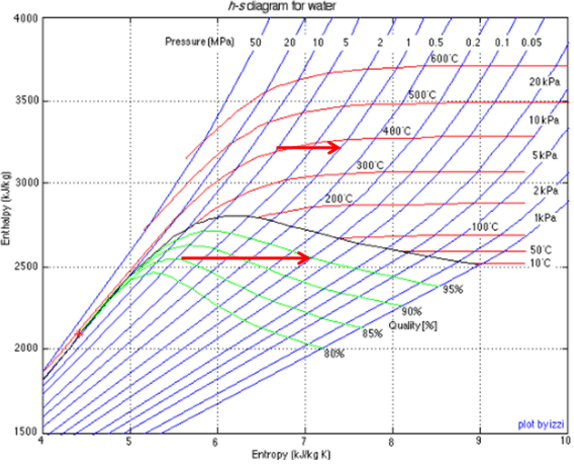 Wet steam is characterized by the vapor quality, which ranges from zero to unity – open interval (0,1). Throttling of the wet steam is also associated with conservation of enthalpy. 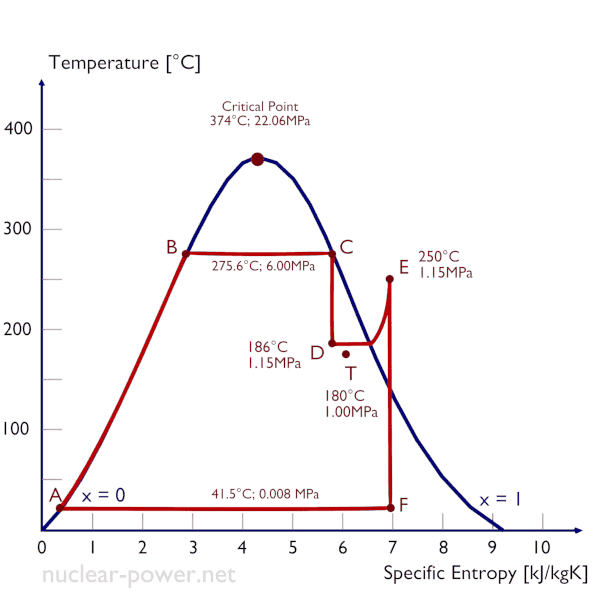 Enthalpy is conserved because no work is done by or on the system (dW = 0), and usually there is no heat tranfer (adiabatic) from or into the system (dQ = 0). But in this case a reduction in pressure causes an increase in vapor quality. As the pressure drops some of the liquid in the wet steam vaporizes and increases the vapor quality (i.e. dryness fraction). This process take place, because the saturation temperature is lower at the lower pressure. The lower temperature, lower pressure, higher quality steam contains the same enthalpy as the original steam. A high-pressure stage of steam turbine operates at steady state with inlet conditions of 6 MPa, t = 275.6°C, x = 1 (point C). Steam leaves this stage of turbine at a pressure of 1.15 MPa, 186°C and x = 0.87 (point D). Determine the vapor quality of the steam when throttled from 1.15 MPa to 1.0 MPa. Assume the process is adiabatic and no work is done by the system. In this case of the throttling process (1.15MPa to 1MPa) the vapor quality increases from 87% to 87.4% and the temperature decreases from 186°C to 179.9°C. Throttling of wet steam usually causes an increase in vapor quality, increase in entropy and decrease in temperature.